Our board of directors is made up of retired public employees like yourself, who work on a volunteer basis. Primary expenses are employment of a lobbyist and member communication, recruitment and retention. We also funded the GABA lawsuit with donations from members. Lyle Manley retired from the Legal Services unit of the Montana Department of Transportation in 2009 after working for over thirty years at the state. He joined the AMRPE Board in 2013 and currently serves as the President. Lyle is the Chairman of the Nominating and Constitution and Bylaws Committees. Cathy Kendall has been on the Board since 2011. She retired from the Office of Public Instruction in 2010. She serves as the Vice President. Jan Brown joined the board in 2010 and has been the secretary since 2012. She retired from the Dept. of Environmental Quality in 2007 and had previously served in the Montana House of Representatives from 1983-1991. James Driggers retired from the Department of Public Health and Human Services after 31 years as a state employee. He is the Treasurer and also serves on the Legislative Committee and the Nominating Committee. James has two sons and lives in Helena with his wife, Elly, who is a newly retired public school teacher. Patty Mott retired from the Dept of Labor in 2012. She has been a board member since 2015. She is the Membership Chairperson and serves on Legislative Committee of AMRPE. Dale Boespflug retired in 2002 after 31 years of service with the Dept. of Public Health and Human Services. He became a member of the AMRPE board of directors in 2013 and serves on the Nominating and Membership Committees. Jim Lewis joined the Board in 2013. He retired from the Montana Department of Transportation in 2011. He is the Chairperson of the Audit Committee and serves on the Constitution and Bylaws Committee. Connie Welsh retired in 2017 from the State of Montana and Montana University System (MUS). She worked for over 25 years for the State of Montana in areas dealing with healthcare and pensions. She served as Administrator of the Health Care and Benefits Division for 10 years before moving to the MUS where she was Director for the MUS Employee Benefit and Pension Plans. Connie serves on the Membership and Constitution and Bylaws Committees. Leo Hudetz joined the Board in January 2019. Leo retired from Billings Public Schools in 2015 and also worked previously for Yellowstone County. The next meeting is on May 21st, 2019 at 9:30 AM. 100 North Park - PERA office, 2nd floor conference room. All are welcome to attend. Disclaimer: AMRPE is not part of any government agency. 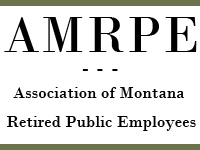 We are 503(c)4 non-profit, working for the benefit of retired Montana Public Employees.